How cute are these Fuzzikins Dozy Dogs? They are the perfect set for children who like both crafting and animals. 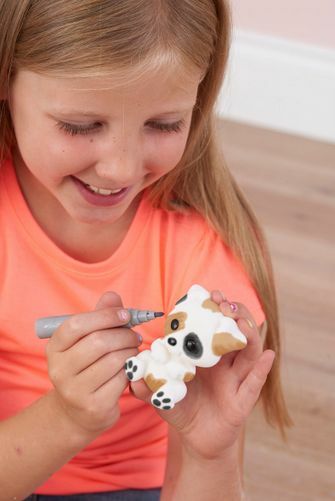 Fuzzikins Craft Dozy Dogs is a craft set for young children to colour and decorate their very own doggy family (to their own design) and to make them accessories for a good night’s sleep. They are for children aged five years old and above. Inside each kit, it comes with three different size, lightweight dog figurines (small, medium and large), three felt tip pens (typical doggy colours are included: black, brown and grey), a brush, self-assembly felt sleeping bags in different colours, other accessories to customise and play with (like eye masks and capes), wooden lollipop stick (to help make up the sleeping bags) and full instructions. The RRP for the sets is £9.99 each and they are available to buy from good stores and Amazon. There are lots of fun Fuzzikins sets to collect. Have a look at Interplayuk.com to see the full range (including the super cute cats). They are a good size and price for birthday party presents and the sort of thing I tend to keep in my present box so I always have a gift to hand when I need one. Now Interplay UK is giving me the chance to give away one of these Fuzzikins Dozy Dogs sets to three of my blog readers and followers. Enter via the Gleam widget below. 1. No bulk, third-party or automated entries. 2. Entrants must be aged 18 years or older and resident in the UK. 3. The winners will be chosen by a random draw. 4. Promoter is responsible for fulfilling the prize and full contact details of the winner will be passed onto the promoter to enable prize fulfillment. 5. The winner’s name may be published on this site. 6. Competition closes on 28th April 2019. My daughter would love this set – so cute! Cute prize, good luck everyone! My grandaughter would love this. I used to have these when I was little and it would be great for my niece to enjoy it too! Love this, perfect for my daughter! My son would love this. He is really into crafting at the moment. Great prize. Arts and Crafts is popular with the family. Dogs, delightful. Great prize. My niece would love this. wow, fab prize, my daughter would love this!! Fab prize, Violet would love it! !